We’re delighted to announce that our edited collection, Digital Methods for Social Science: An Interdisciplinary Guide for Research Innovation (Palgrave, 2015), is now available! The collection started life as part of the Digital Methods as Mainstream Methodology events and network. Thanks to everyone who contributed. An overview of the seminar series is available as a discussion paper on the National Centre for Research Methods website. Also available on the NCRM website is a podcast about the network and the opportunities and challenges of digital methods for social scientists. A guest post by Phillip Brooker on the Chorus team’s social media data capture and analysis tools. The promise of social media as a resource and topic of social science research is thus far as frustrating as it is tantalising. It is widely recognised that social media may have much to offer academic research, yet acquiring and making effective use of this material – part of what some refer to as ‘the big data challenge’ – seems to sit just outside of our current technical skillset. Although computer science has enjoyed a recent burst of activity in the development of algorithms for capturing and processing social media data in various ways (such as Thelwall et al.’s (2010) SentiStrength, which is able to produce values for positive and negative sentiment in short text, or Cui et al.’s (2011) TextFlow which is a temporal topic model designed to capture the evolutionary aspects of unfolding topic flows), the majority of these computational techniques have failed to filter through to social science in any significant way. The chief barrier to this is in the difficulties of securing a mutually productive relationship which requires both a level of technical understanding from social scientists, and a sensitivity to the methodological and analytic interests of social research on the part of computer scientists. Tackling this barrier head-on, Chorus is a software development project that aims to facilitate social media research for social science by bringing together the existing algorithms and metrics from the computer sciences with the requirements and methodologies of the social sciences. The Chorus team has its origins in two projects with nodes located at Brunel University – MATCH (www.match.ac.uk), which is a research programme investigating various issues around medical device manufacture, and FoodRisC (www.foodrisc.org), which is a European initiative directed towards improving risk communication around food issues. The team is a small, close-knit, interdisciplinary collaboration of programmers, web developers, and social scientists in the role of requirements engineers. Hence, the Chorus project is an attempt to utilise a broad array of expertises to furnish social science with a bespoke social media data capture and analysis tool, for both quantitative and qualitative research, and to find a way of making the technical world of algorithms more user-friendly for an audience unused to dealing with them. The Chorus package comprises of two distinct programs. 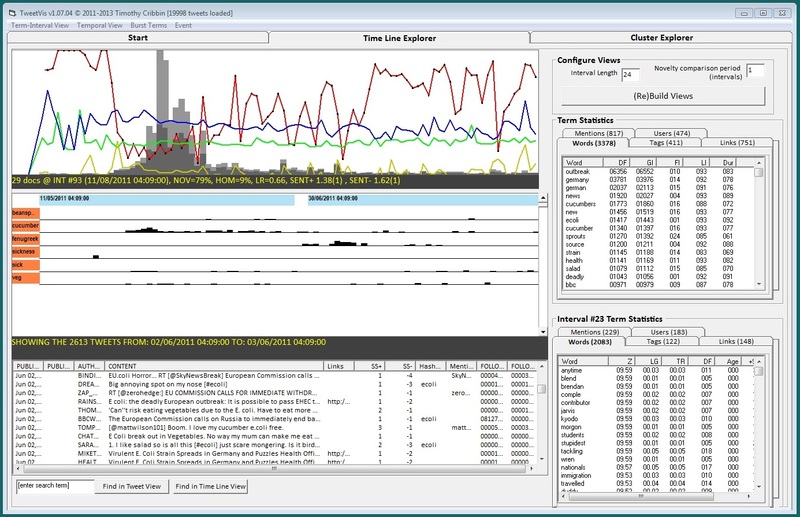 Firstly, we have Chorus-TC (TweetCatcher), which is a browser based service for managing Twitter queries, automating retrieval of new posts, along with sentiment analysis (using Sentistrength: Thelwall, 2010) and archiving functionalities. Tweetcatcher allows users to sift Twitter for relevant data in two distinct ways: either by topical keywords appearing in Twitter conversation widely (i.e. semantically-driven data) or by identifying a network of Twitter users and following their daily ‘Twitter lives’ (i.e. user-driven data). Secondly, we have Chorus-TV (TweetVis), which is a visual analytic suite for facilitating both quantitative and qualitative approaches to social media data in social science. Visual analytics (VA) is an interdisciplinary computing methodology combining methods from data mining, information visualization, human-computer interaction and cognitive psychology. The VA approach is highly relevant to the aims of Chorus, enabling exploratory analysis of social media data in an intuitive and user-friendly fashion. Two main views are available within Chorus-TV. The Time-Line Explorer (below) provides users an opportunity to analyse Twitter data across time and visualize the unfolding Twitter conversation according to various metrics (including tweet frequency, sentiment, semantic novelty and homogeneity, collocated words, and so on). By contrast, the Cluster Explorer (below) allows users to delve into the semantic and topical makeup of their dataset in a way that is significantly less reliant on the chronological ordering of topics. Cluster explorer represents semantic similarity on a 2D map, which displays the semantic similarity of intervals, tweets and terms as their proximity to each other in the cluster map. 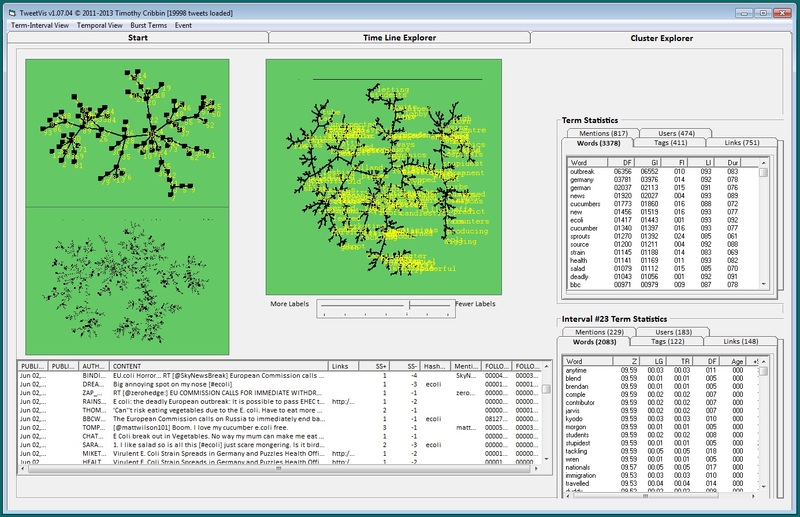 This provides access to interval-level, tweet-level and term(word)-level visualisations and provides a means for users to explore the different topics prevalent within their dataset and trace relationships between them via ‘topical nodes’ (which may form central ‘hub topics’ from which other sub-topics branch outwards). Our choice of Twitter as an initial case is based on its status as a ‘simplest case’ of social media data, due to it essentially consisting of short text and links to other media. However, one of the challenges for the future of Chorus will be to conceive of analytically useful ways of visualising data other than short text, including images and sounds, which would allow for an expansion of the software into other social media platforms (such as blogs, Facebook, Tumblr, Instagram, SoundCloud, FourSquare, and so on). More widely, the chief ongoing challenge for social media research as a field will be in the continued development of a research-supporting software infrastructure (and accompanying methodologies that enable social scientists to make sensible use of software such as Chorus) in such a way as to be both intuitive to use and flexible enough to be tailored to a wide range of specific and unspecified research questions. The technical development of software such as Chorus (and the continued feedback we hope to get from social science-trained users) is, we hope, the first step towards formalising a robust social science research programme that can take advantage of the possibilities of social media data in an empirically defensible way. To that end, we welcome any queries about our project and about gaining access to our tools, and are eager to hear the thoughts and comments of interested users via the email address listed above. Cui, W., S. Liu, L. Tan, C. Shi, Y. Song, Z. J. Gao, X. Tong and H. Qu (2011) ‘TextFlow: Towards Better Understanding of Evolving Topics in Text’, IEEE Transactions on Visualization and Computer Graphics, 17(12), 2412-2421. Thelwall, M., K. Buckley, G. Paltoglou, D. Cai and A. Kappas (2010) ‘Sentiment Strength Detection in Short Informal Text’, Journal of the American Society for Information Science and Technology, 61(12), pp. 2544-2558. On 15 March, we held our third and final Digital Methods as Mainstream Methodology conference at the University of Manchester. As usual, there was a packed agenda, starting with a talk via Skype from David Beer, Senior Lecturer in Sociology at the University of York. 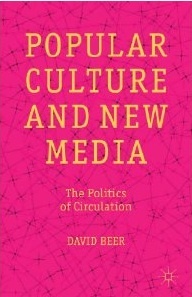 David has a new book, Popular Culture and New Media: The Politics of Circulation, being published by Palgrave Macmillan in July 2013. The book will look at these issues, and others, in more depth. 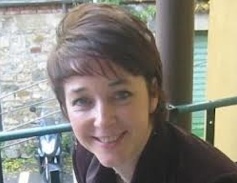 Our second speaker was Noortje Marres, Senior Lecturer in Sociology at Goldsmiths, University of London. 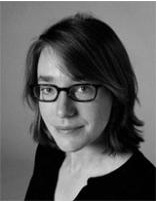 Noortje is the brains behind the Issue Mapping Online wiki, and convener of the college’s MA/MSc programme in Digital Sociology. She talked to us about issue mapping as an interface method, looking at the links between technology, science and society, and how these disciplines interact. She detailed how issue mapping deploys methods and tools of network and content analysis, taking us through various mapping programmes, including Twitter StreamGraph and Infomous, to visualise online content and data. In 2012, Noortje published her book Material Participation: Technology, the Environment and Everyday Publics (Palgrave Macmillan). After lunch, we heard from Chris Griffin, Professor of Social Psychology at the University of Bath, who explored her research project on the culture of intoxification and young drinkers’ habits – what she described as “calculated hedonism as a cultural norm”. She offered a useful distinction between using digital methods and researching the digital world, and looked at how social interaction is used by alcohol manufacturers to forge an emotional connection between their consumers’ lives and their brand proposition. She then went on to talk about a blurring between user generated content and brand promotion in some companies’ online publicity campaigns. 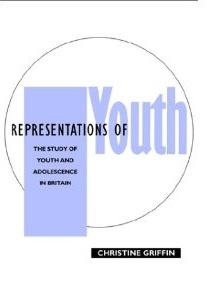 Chris is the author of Representations of Youth: The Study of Youth and Adolescence in Britain and America (Polity Press). Lastly, Rachel Gibson, professor at the Institute for Social Change at the University of Manchester, joined us to talk about CODE (‘Comparing Online Democracy and Elections’), an ESRC-funded project that undertook a four-country comparative analysis of the use of new media by political parties and citizens. Rachel explored whether the use of new media in this context is changing the nature of political campaigning in that it is democratising and deprofessionalising the process, or whether it was promoting a new mode of electoral campaigning – ‘citizen campaigning’. Rachel offered an interesting comparison of UK and US political websites, how they encouraged citizens to get involved during national election campaigns, what information was given on these sites, and what success they had. Rachel is the author of The Growth of Anti-Immigrant Parties in Western Europe (The Edwin Mellen Press). Before the end of the conference, we gathered to discuss the future of digital methods with both the day’s speakers and the core team behind the DMMM events. We looked particularly at the impact of Research Ethics Committees at universities in terms of engaging in groundbreaking work that may be seen as unethical – does traditional academia recognise research that is done for the greater good, if it involves having to set up fake profiles online to gather information, or editing the material that is gathered, in order to protect the identities of those who originally produced it online? In short, is academia behind the times, still seeing digital methodology as marginal rather than central to contemporary research? There were no definitive answers, and individual experience, together with different experiences of individual universities, may differ. But there is certainly lots more to discuss around these issues over the coming months and years. This is not the end of Digital Methods as Mainstream Methodology – and we look forward to seeing what now emerges as a result of our three conferences. Watch this space. An overview of Event 2, including a link to Peter and John’s presentation, is available on the British Library Social Sciences Research blog. The second event in the Digital Methods as Mainstream Methodology seminar series was held on 7th December at the British Library in London. Speakers at the event were Peter Webster and John Kaye, discussing the digital resources available for social sciences at the British Library; Mike Thelwall, University of Wolverhampton on his work on sentiment analysis for the social web; Sue Thomas, DeMontfort University, on developing the concept of ‘technobiophilia’ and the use of digital tools to aid research across diverse disciplines; and a telecast from danah boyd, Microsoft Research / New York University / Harvard Berkman Center on strategies for capturing ethnographic data in a networked era. In addition, ten PhD researchers gave lively and focused ‘PechaKucha’ style presentation. The format for these lightening talks was 10 slides showing an image (or a small piece of text), each displayed for 20 seconds, or 3 minutes and 20 seconds in total. You can find some of the materials for these talks here. If you missed the event and would like to find out what was discussed, video interviews with Mike and Sue are being uploaded on our YouTube channel. 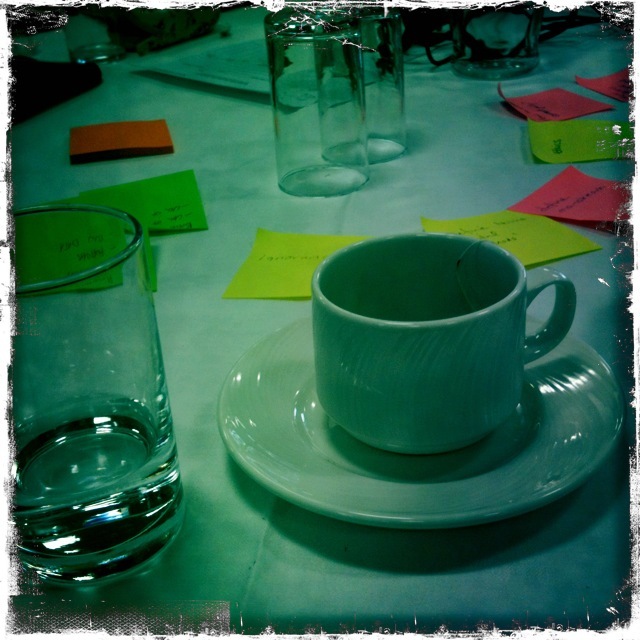 One of our delegates and Pecha Kucha presenters, Amy Guy, has written about the event here. We also have a Storify of conversations around the day, including Twitter coverage (you can also search on Twitter for the hashtag #DMMM2). Registration is now open for the second Digital Methods As Mainstream Methodology seminar, which will be held at the British Library on 7 December 2012 between 9.30am and 4.30pm. Full details of the seminar are available here. Seminar places are limited, and places will be allocated on a first come, first served basis. Confirmation of a place will be sent out after the registration closing date (30 November 2012). We’ve just sent out a call for papers for our next event on Friday 7 December 2012 at the British Library in London. This is an exciting opportunity for PhD students and early career researchers to present their work at our showcase seminar. At our first event, we asked delegates to reflect on the opportunities and challenges of digital methods through an affinity mapping exercise. The idea of this activity was to solicit ideas and to develop some consensus around the key issues for the network to take forward. Delegates were asked to brainstorm ideas in groups, write one issue per post-it note and stick them on the table. Then, the notes were stuck on the back wall of the meeting room and the group was asked to organise them by placing linked ideas together. 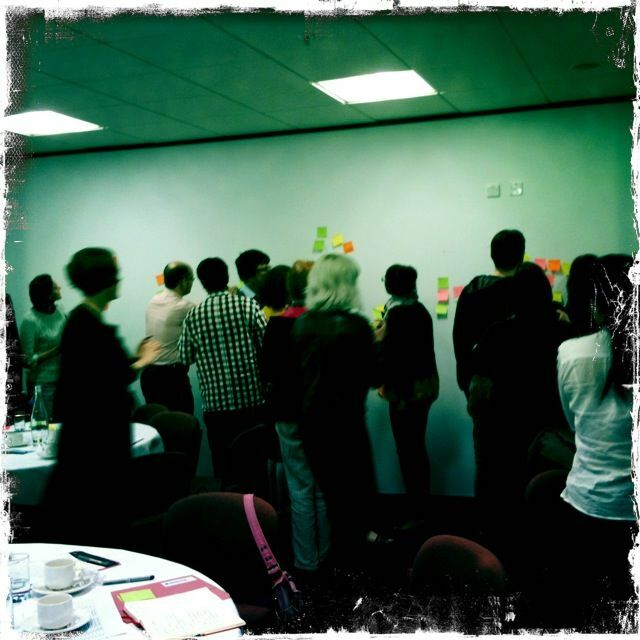 Through this collaborative sorting exercise, we were able to categorise the issues and identify over-arching themes. 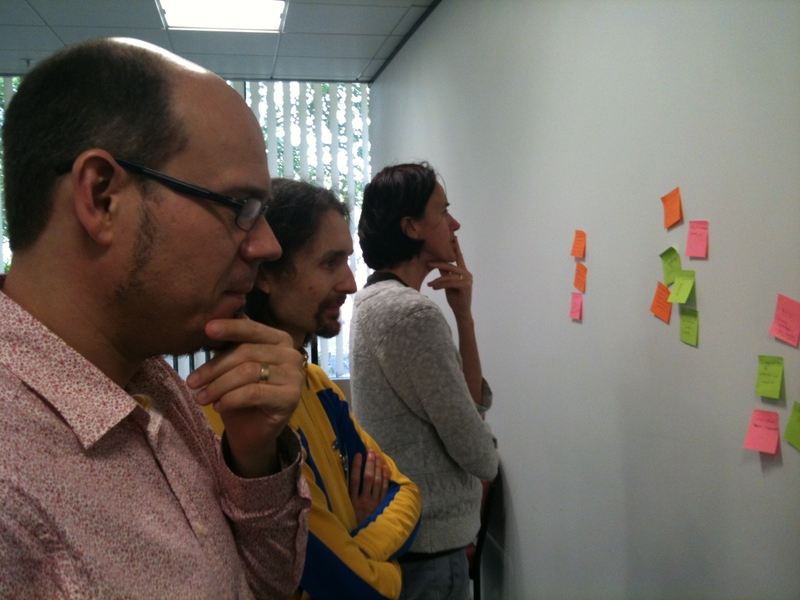 The affinity mapping was used as a prompt for a group discussion on the opportunities and challenges identified. Key issues included defining ‘digital methods’, dealing with data, and thinking about research populations and context. The output from the exercise was summarised as a mindmap. You can download the map as a PDF here. The first in the Digital Methods as Mainstream Methodology seminar takes place today at the University of the West of England in Bristol. We will be tweeting the event using the #DMMM1 hashtag. Follow the conversation, and join in using Twitter (we’re at @DMMM_NMI), or comment via the blog. We’re also on Facebook – see the badge on this site – and will be both blogging about the event and posting videos from the day on YouTube.